Northwest National Real Estate: Sold! Nice Farm Home In The Country! Sold! Nice Farm Home In The Country! Must see country property! This farm home sits on 4.7 acres with beautiful views. Many custom touches in this home with woodwork on the walls, counter tops and new floors. Beautiful newly refinished bathroom on the main floor, new laundry room, and new counter tops in the kitchen. 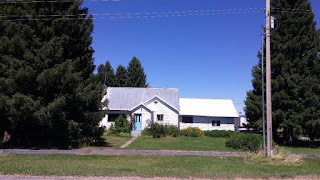 There are many outbuildings and sheds on this property with plenty of room for animals. With this property located on the Cave Falls Highway you are so close to world class fishing, hunting, and endless outdoor recreation. Call Jennifer today at (208) 624-4382 to see this beautiful property! Priced at $165,000.